Twitter is the newest company to join in on the Android beta fun. Earlier this week, Snapchat opened up a beta program, a move that apparently a lot of companies are looking to make. Once joined, you can access experimental features that won’t be live to the general public, but keep in mind that when using a beta, there is always a chance that you can experience issues. Joining is easy – simply join their Google Group, then opt-in to the beta with the click of a button. 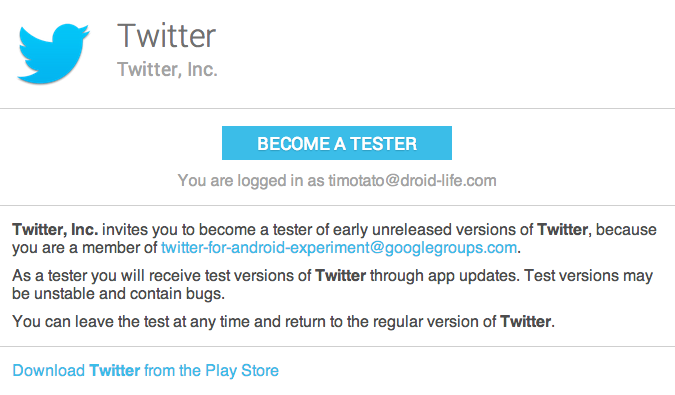 Once in, you will download the beta Twitter app from Google Play. From there, it is up to you if you want to give feedback to Twitter on the beta features. You are not required to do anything, but they would probably appreciate it. We are hoping for a beta feature to remove blue conversation lines. Fingers crossed.